In a medium shallow glass or stainless-steel bowl, combine the steak, lemongrass, half the garlic, the oil,1 1/2 tablespoons of the lemon juice, 3/4 teaspoon of the sugar, the salt, and black pepper. Set aside. In a small glass or stainless-steel bowl, combine the fish sauce, the remaining 1 tablespoon lemon juice, garlic, and 2 teaspoons sugar, the water, vinegar, and red-pepper flakes. In a large glass or stainless-steel bowl, combine the romaine, carrots, cucumber, cilantro, and mint. Light the grill or heat the broiler. Thread the steak onto eight skewers. Grill or broil the meat, turning, until done to your taste, about 5 minutes for medium rare. 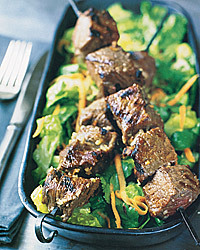 Toss the dressing with the salad and serve topped with the satays. Although beef traditionally calls for a red, these seasonings suggest a white wine. A rich Californian, such as a full-bodied Chardonnay, can play to both the beef and the salad here. If you prefer red wine, try a light, fruity Beaujolais.